Karen Hoffman, president of the Bradford Group, a marketing/ public relations/advertising firm with a strong portfolio of international clients, has more than 20 years of expertise in the travel industry. From the time she worked as a news editor in the Jerusalem Bureau of Time Magazine to today, Hoffman has continued to travel and work with people in diverse cultures including Africa, South America, the Mediterranean, Middle East and Asia. Her achievement in opening the Gambia National Tourist Office for the Bradford Group, led to more clients from Africa including Kenya, Zambia, Zambia Airways, Morocco, Royal Air Maroc and InterContinental Hotels Cote d’Ivoire/Africa. In 1997 she launched the Tanzania Tourist Board Campaign in the US which tripled the number of visitors from the US. The US is now Tanzania's #1 source for tourists. Taking it a step further, in 1997, Hoffman created and initiated the prestigious "World Tourism Award" for Reed Travel Exhibitions and co-sponsors American Express, Corinthia Hotels, and the International Herald Tribune, an award that is presented annually at World Travel Market, London. Under Hoffman's initiative, the Bradford Group led Public Relations and Media efforts for the International Institute for Peace Through tourism (IIPT) first Global Summit in Jordan sponsored by American Express in 2000. Following the success of the Jordan Summit, Hoffman and the Bradford team were asked to head up promotion and planning efforts for additional IIPT summits in Geneva and Thailand as well as four regional conferences in Africa. Under Hoffman’s initiative The Bradford Group team played a major role in the organization and marketing of the World Trade University Global Secretariat’s World Tourism Marketing and Investment Summits in Nanjing (2004) and Beijing (2007), China and Busan, Korea (2008). Hoffman was asked by the American Tourism Society in 2004 to lead the public relations effort as the organization expanded its reach to new regions of the world, being charged with the press and media relations for their annual conferences in Hungary, the Czech Republic, Israel, Jordan, Croatia, Poland, Egypt and Kosovo. In 2005, she was responsible for successfully launching and overseeing an ongoing US promotional campaign for theCorinthia Hotels, a Malta headquartered luxury hotel brand in the Czech Republic, Hungary, Libya, Malta, Portugal and Russia and the Corinthia Hotel, Whitehall Place, London ( to open in early 2011). Recognized widely among her peers for her in-depth knowledge of Africa, in 2005 the Africa Club of the Harvard Business School asked her to organize and chair the first Travel and Tourism Industry Panel as part of their annual Africa Business Conference. A frequent speaker at tourism expos, forums and conferences including Africa Travel Association events Hoffman has been a guest lecturer at the New York University Tisch School of Sports, Tourism and Hospitality. Good Will Ambassador in North America for “Just a Drop,” the clean water charity of Reed Travel Exhibitions/World Travel Market. The Bradford Group is a New York-based full service marketing agency that provides comprehensive, fully integrated programs designed to achieve maximum results in branding, marketing, communications, advertising, public relations, sales promotion, special events and media relations. As part of the Bradford Group's expansive global presence, one of our unique advantages is to leverage our international contacts and activities to expand the worldwide brand awareness, network and customer base for our clients. The Bradford Group represents a diverse group of clients with a focus and expertise in travel and tourism promotion, tourism investment, and trade and investment forums and activities for multi-sector industries outside of tourism. The Bradford Group has worked with many prestigious and global clients including CHI Hotels & Resorts/ Corinthia, the Tanzania Tourist Board, American Tourism Society, World Tourism Award and World Trade University. The Bradford Group served as the international headquarters for the Africa Travel Association (ATA) for 16 years. The Bradford Group's President, Karen Hoffman, is currently ATA's First Vice President. The Bradford Group is actively involved and is a member of many groups, including Skål International, Cornell Hotel Society, American Tourism Society and Society for Accessible Travel & Hospitality. Karen Hoffman also serves as the United States Good Will Ambassador for "Just a Drop", the clean water charity of Reed Travel Exhibitions. Specialtiesbranding, marketing, communications, advertising, public relations, global perspective. 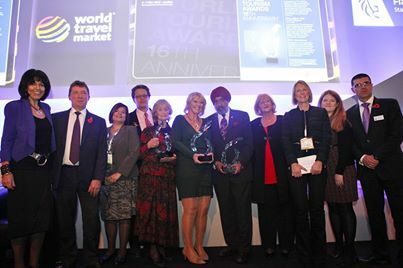 Congratulations to the Born Free Foundation; Fiona Jeffery, OBE, Founder & Chairman, Just a Drop; and Skål International who were presented with the 2013 World Tourism Awards o in a ceremony at World Travel Market, ExCeL Centre, London. Fiona Harris, Director of International PR, Corinthia Hotels; Sarah; and Craig Moyes, Portfolio Director, Leisure Travel Portfolio, Reed Travel Exhibitions.